This is where the garbage trucks drop off their rubbish to be sorted and reloaded for land fill. The machines are used to clean their yard. It's very dusty with airborne contaminants. You can imagine 10 garbage trucks per hour dumping their rubbish from council collections. The depots are located in Northgate and Rocklea, Queensland, Australia. 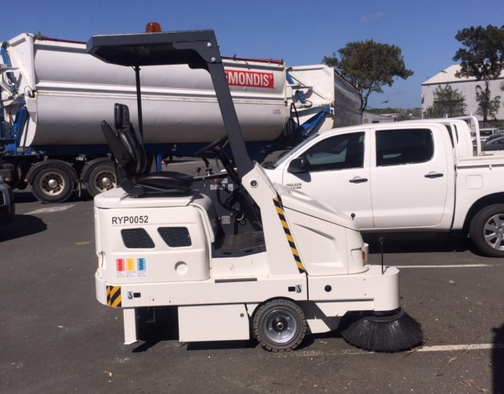 The machines had to be painted in Remondis corporate colours and registered for use on the street. Remondis had a couple of competitor machines working there, both of which were maintenance disasters. It was a really professional sell with the buyer very carefully evaluating all machines in the market. The Magnum was by far the strongest with the most proven and efficient drive train. Thanks to Tony Bilos, owner at ASC Sweeper, for sharing the news!